CSAR lectures are open to members only, but we welcome new members and would encourage you join CSAR online in advance of the event you wish to attend. If you’d like to try a lecture or two before you consider an annual subscription, please select ‘Pay-As-You-Go’ or one of the concessionary memberships for which there is no annual fee, but there is a fee for attending each lecture. For further details, please see all membership options. Lectures start at 7:30pm, and tea, coffee and biscuits are available free from when the doors open at 6:30pm. Advance booking is not available, so please arrive early to be sure of a seat. Lectures are usually held in the Wolfson Hall in Churchill College, Storey's Way, Cambridge, CB3 0DS. Occasionally lectures are held in other venues. Please check the individual lecture listing which has Google map directions. Car parking for those attending a CSAR lecture is available in the Staff Car Park on Churchill Road, which is off Storey’s Way. There is more parking further along Churchill Road, and in the Möller Centre at the far end. Bicycle parking is available in front of Churchill College. Dining for those attending the lecture is available in the Churchill College dining hall before the lecture. This canteen is self-service and you can pay with cash. The dining hall is open between 5:45pm and 7:15pm. The food servery is at the back of the dining hall with the servery entrance on the far left (as viewed from the dining hall doors), the servery exit and tills are on the far right. A table is set for CSAR so that attendees can join other members and the speaker for dinner. The table usually has a large sign with the CSAR logo. Several places in the centre of the table are reserved for the speaker, president and invited guests but lecture attendees are welcome to join either side. Coffee and biscuits are available before the lecture – but please remember to check in at the CSAR reception desk first. The buttery (college bar) is also open throughout the evening for light refreshments (including coffees and pizzas). Certificates for Continuing Professional Development (CPD) are available to show you have attended the lecture – please ask a council member on the reception desk to request one. 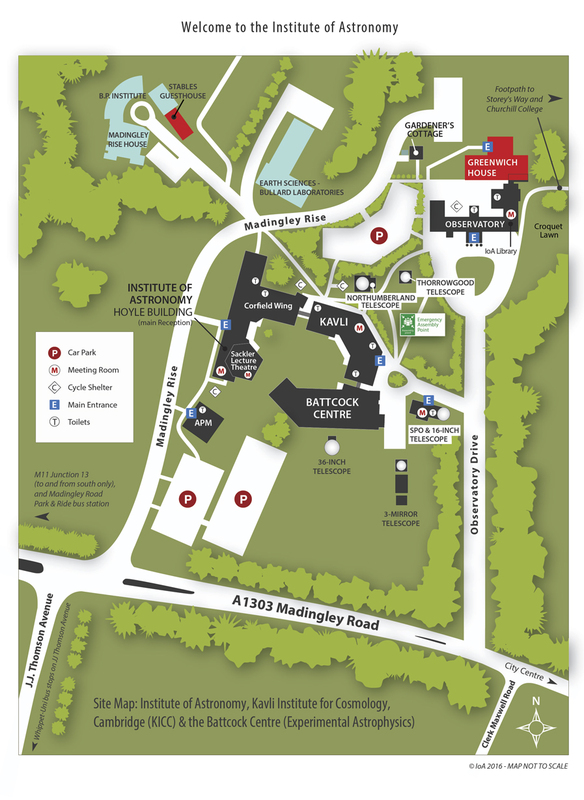 Car parking for those attending a CSAR lecture is available in the car park immediately on the right after you turn into Madingley Rise. The Sackler Theatre foyer is in the main building of Institute of Astronomy. This is just a minute's walk further along Madingley Rise, on the right-hand side. Bicycle parking is available in front of the main building. Refreshments are available before the lecture, but please remember to check in at the CSAR reception desk first. Hearing induction loop is available in the Sackler Theatre.